Is anyone else in a race-to-the-finish-line dash to get their Christmas cards and/or calendars ordered by tonight? There are so many great deals out there right now (golden words in my book: free shipping), but they all expire at midnight. I can tell you one thing: Here are a couple of pictures that won't be going into the calendar. My belly shot at 16 weeks. 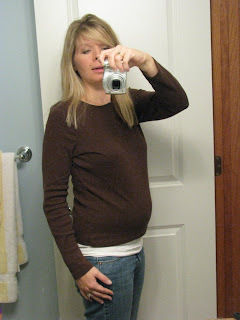 I should note that was taken in the morning, when I look appropriately 16 weeks pregnant. By evening, I look approximately 25 weeks pregnant. And no, I'm not kidding. See? That was taken around 8:30 PM. Notice that I used the camera to hide my face, like one of those black bars they put on the "fashion don'ts" in the back of the magazines. And if you can't see the difference, it's only because I have to twist into an mannequin-like position that is oh-so-comfortable to take my own picture. Either that, or you are squinting. And you really shouldn't do that. Your face could stick that way. In other pregnancy news, I FELT THE BABY MOVE THIS WEEK. I have the whole story posted at 5 Minutes for Parenting today, in the continuing saga of "And Baby Makes 6: Kelly's (Last) Pregnancy Journal." Frankly, I feel pretty cool that I'm able to discern the baby flutters this early in the pregnancy. You can read the details here. GASP!!! Feeling the baby kick is THE BEST PART about being pregnant. Okay, maybe the only good part. Either way I am happy for you!! Yeah. Feeling the baby kick makes everything good. that is hilarious - i swore i gained 10 pounds a day, which magically disappeared by nighttime! yay on the baby moving!!! that is the COOLEST!! We ordered our Christmas cards from Snapfish and an order of 100 cards took less than a week to ship from the day I ordered them. There's a coupon right now for 20% off your order (coupon code WINTER09). Baby movement is heavenly. Enjoy every nudge. You look fantastic! You are being very hard on yourself. Also, baby movement, SO FUN!!! Woo hoo! Tsk. I look as pregnant as you do in the second photo and AM I PREGNANT? Nope. 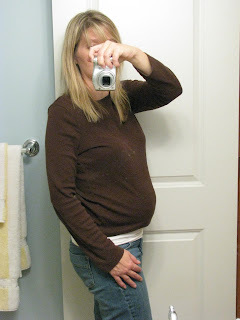 I AM 25 weeks and by 8pm I look about 7-8 months pregnant! But I truly think it's the fudge. Please take it AWAY!!!!!!!! Kelly, you look fabulous! And I think it's absolutely amazing that you are feeling the baby kick this early in the pregnancy. I wanted to thank you for contacting me, and just drop you a comment here. I've had a few of my clients tell me that my email replies occasionally get sent to their spam folder, so wanted to make sure my reply got through to you. Thanks again!